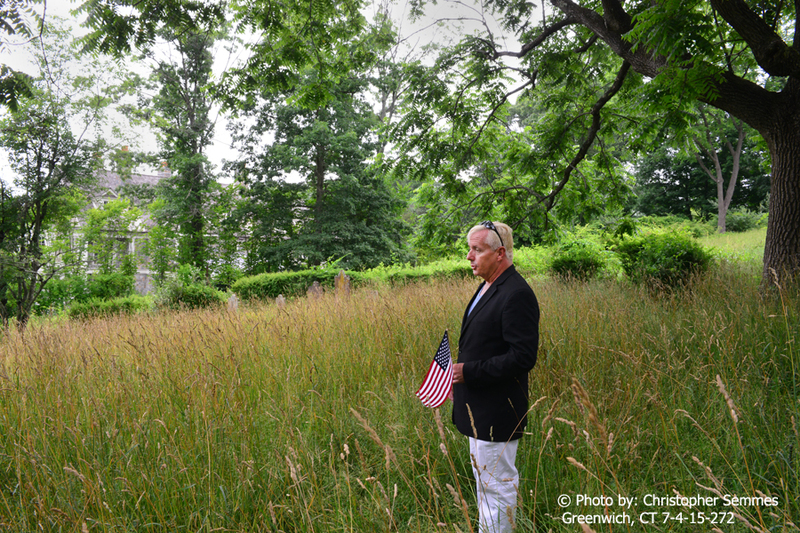 The Association announces that Mr. Bobby Keeler is no longer maintaining or providing care for the three family farm plots in Greenwich, Connecticut. 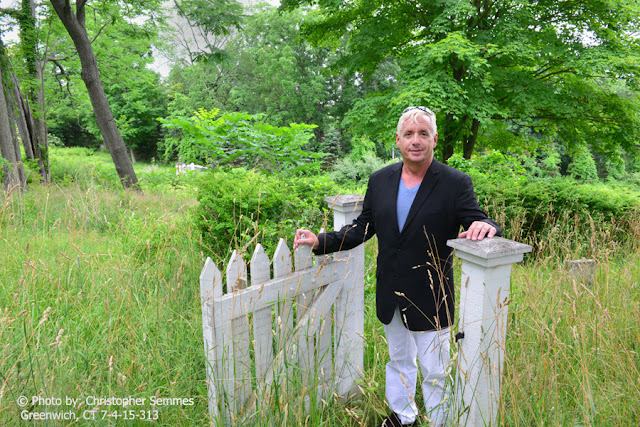 As a result of an on-site inspection dated July 4, 2015 of the family plot located on the Solomon Mead Farm at the corner of Cliffdale and Riversville Road in North Greenwich lawn and brush clearing was initiated on July 8. At the request of the Association professional photographer Christopher Semmes recorded the conditions. The bayberry bushes that surround the perimeter of the cemetery have also been trimmed and invasive vines removed. "The Association looks forward to bringing this site back to a high standard, one that was established many years ago," reported Association Jeffrey Bingham Mead. 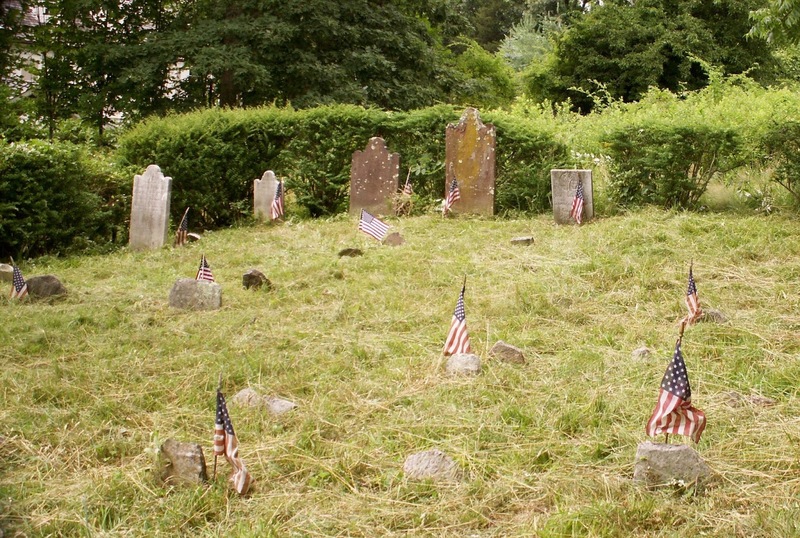 As a result of an on-site inspection dated July 2, 2015 of the family plot located adjacent to the Cos Cob Mill Pond major tree work and pruning of bushes was initiated. Work started on July 7. Since the first week of July, 2015 the lawn has been cut and trimmed. Selected trees have been removed entirely with more as of today's date -July 30- slated for cutting. Likewise, tree limbs have been pruned, especially along the land that connects the cemetery to Relay Place, a dead-end public residential street in Cos Cob. At the request of neighbors trees and bushes have been removed to allow for improved view of the Cos Cob Mill Pond. In less than five days after major cleanup and tree pruning was initiated there are signs of improvement. The embankment along the Cos Cob Mill Pond has also been substantially cleaned up. Some rocks from the wall fell into the Mill Pond, probably due to storm conditioned ushered in by Hurricane Sandy several years ago. Efforts to restore and improve the wall along the shore are in process. We expect to have additional trees and and around the cemetery site removed, topped and pruned into the month of August. Two cedar trees have died and will need to be removed. An apple tree near the embankment has been pruned back. Various sumac trees and poison ivy vines have been removed, too. Our neighbors at the end of Relay Place have removed the chain link fence and replaced it with a much more attractive wood-treated one. Remnants of the old fence are near the entrance to the cemetery property. We expect that the old chain link fence will be removed shortly. As stated in the previous blog post, the gravestone of Zetta Mead, wife of Colonel Ebenezer Mead, was returned at long last to the cemetery next to the Second Congregational Church known as New Burial Grounds. 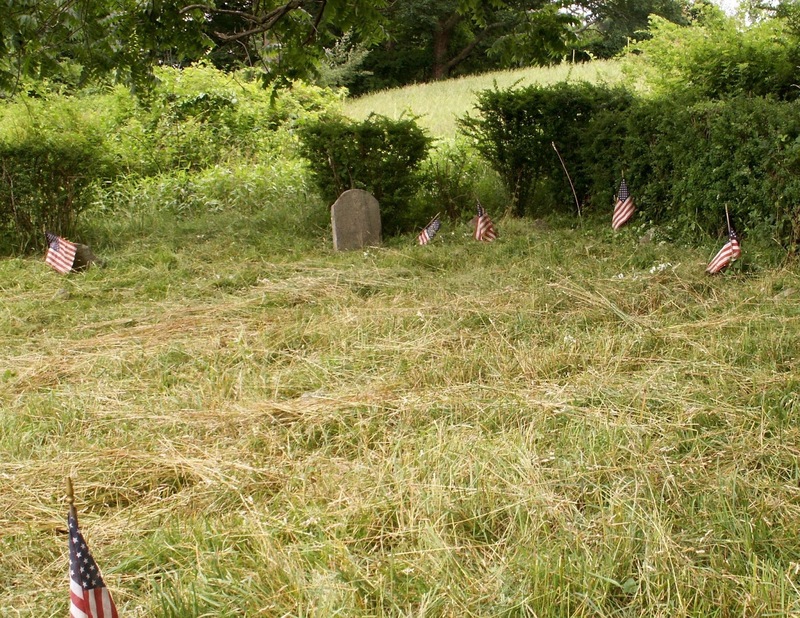 In the process of repatriating the Zetta Mead gravestone we uncovered two gravestones lying flat under several inches of sod. The first to be uncovered was the marble marker for Dr. Shadrach Mead, who died September 16, 1844 aged 87 years. The listing pictured above in Spencer P. Mead's survey of burials incorrectly states that he died in his 66th year. Next to Dr. Mead's gravestone we found the burial marker of his wife, Tammy Mead, who died April 21, 1814 aged 50 years. Both are adjacent to each other. We suspect that these stones were also damaged a century ago when scaffolding collapsed into the cemetery during a windstorm. Are there other hidden gravestones here? We would not be surprised. Be assured that when or if they are found we'll report the news here. 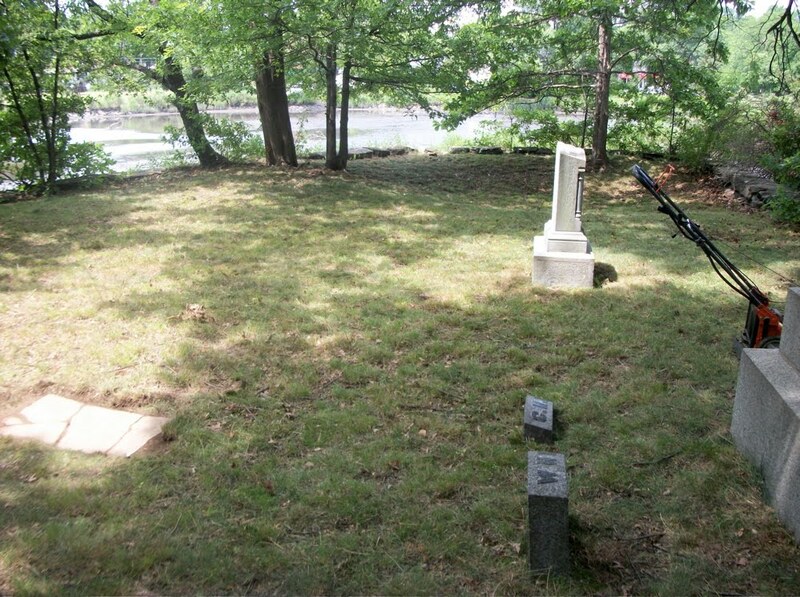 In the foreground are the rediscovered gravestones of Dr. Shadrach Mead and his wife Tammy Mead. Just beyond the five upright gravestones is the one for Zetta Mead, who died in 1807. 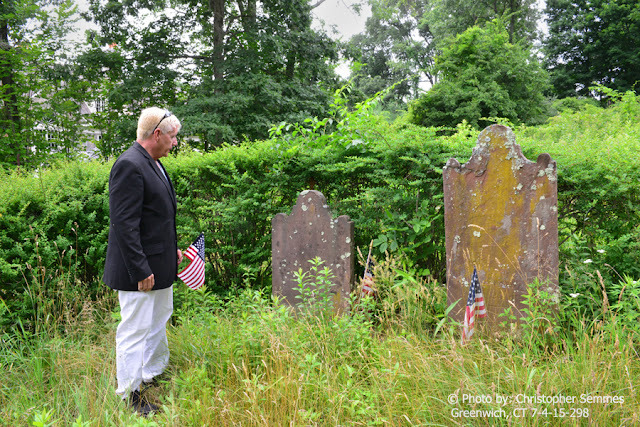 Zetta Mead's gravestone (left, laying flat) has been returned to New Burial Grounds Association Cemetery next to the Second Congregational Church in Greenwich. In the mid-1980s we accidentally discovered the marble gravestone of Zetta Mead -who died in 1807- in the rear of the house where Caroline Mills Smith Mead died in 1910. It was used as a path stone behind that house on Relay Place, Cos Cob. How did it get there? We suspect that her marker was a casualty of the collapse of scaffolding around the then-dismantled Second Congregational Church steeple circa 1915. The steeple had been dissembled for the first time. A church committee found it to be in hazardous condition, hence the removal and eventual reassembly of the steeple. The scaffolding, however, was in a free-standing state. So, when a windstorm came Easter weekend the scaffolds collapsed into the adjacent cemetery. 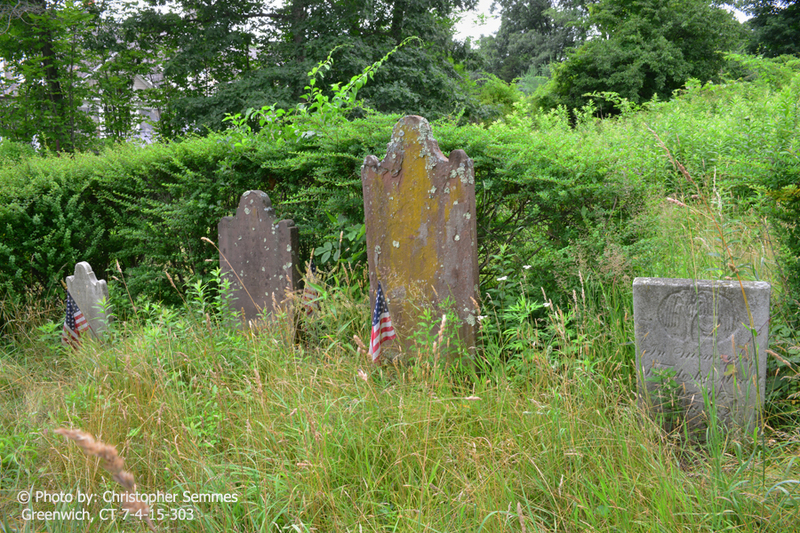 When he was among the living then-Town Historian William E. Finch, Jr., said that some local residents ran off with some of the broken gravestones. See the bottom of this page from Spencer P. Mead's survey of burials in the New Burial Grounds Cemetery. 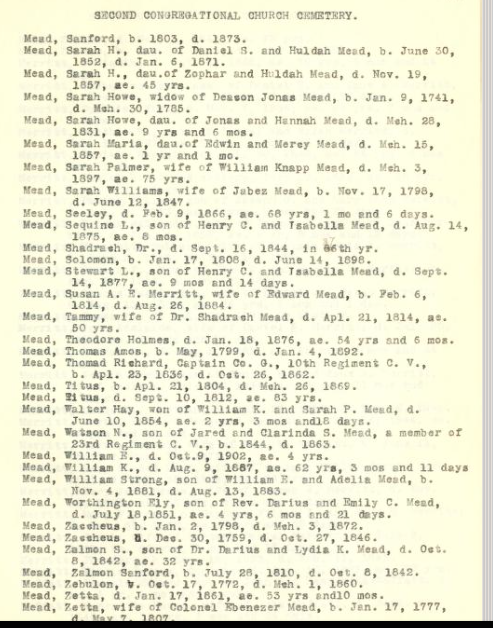 Zetta Mead, wife of Colonel Ebenezer Mead, born January 17, 1777 and died May 7, 1807, is listed here. On Monday, July 27, 2015 the Zetta Mead gravestone was removed from the plot in Cos Cob. It has been transferred to a family plot in the New Burial Grounds Cemetery. It has not been ascertained that its new location is precisely where Zetta Mead was buried. In the process of relocating Zetta Mead's stone we made another surprising discovery. For more on that go to this link.